Bucky bingo is a real fun place to play your favourite game. Super friendly chat rooms, super fun games and super prizes & jackpots await all players. If you are looking for some high-quality online bingo and slot action, then look no further than the Bucky Bingo app. Created so that users can experience the Bucky games whether you are on the move or sat at home, the app is available on any Android device and can also be downloaded to any iPhone/iPad. New customers will be treated to the generous welcome offer when you join at – www.buckybingo.co.uk check it out yourself! 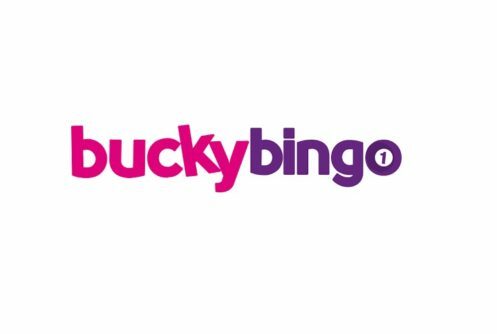 It is easy and quick to sign up for, so if you are a fan of online bingo and other slot games, Bucky is the place for you. 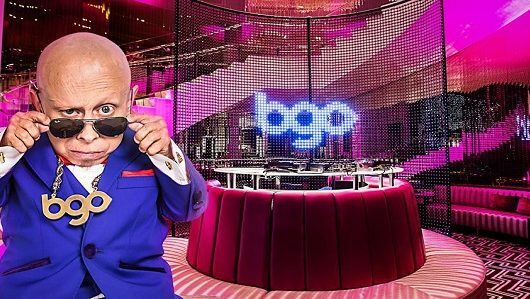 As winners of the ‘Best Boutique Bingo Site’ at the BingoPort Awards back 2016, you can play safe knowing you are on a winning app and site. Bucky Bingo app on Android is really easy to get. 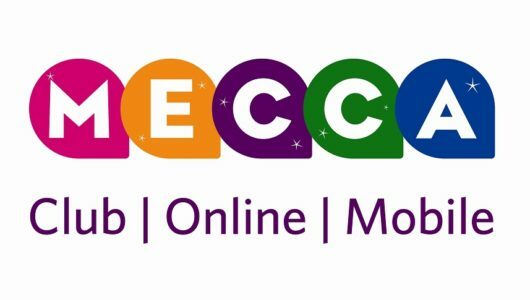 To download the app onto your Android mobile, go the www.buckybingo.co.uk and register for your account, then you need to click on the Android icon and then click ‘OK’. Scroll to the app and download it to your device. When the app has downloaded, click on it and then go to ‘Settings.’ Inside the settings menu, click on the slider for unknown services and then click ‘OK’ again. The last step is to simply press ‘Install’ and you will be all good to go! There is also a Bucky Bingo iPhone and iPad app available. To get this, join on the Bucky site here to register your details www.buckybingo.co.uk and when you have an account you can click on the ‘Available on the App store’ button. This will navigate you to the app store, where you can download the app just like any other. Available on either Android or your iPhone or iPad, the Bucky app has been made easily accessible for any fellow bingo and slot players out there. Once you have the app, you can create a player account in no time at all. Registration takes a few minutes and all very straightforward. 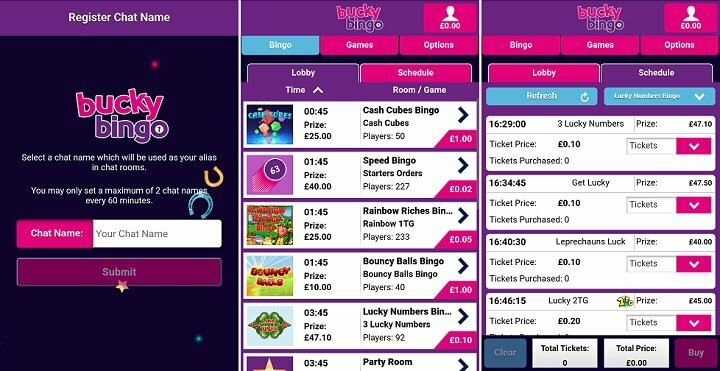 The Bucky Bingo app does, of course, stay loyal with the bright purple and pink colour scheme, which is used across the app’s backdrop and navigation buttons. The bright colour theme helps add to the site’s inviting nature and welcomes players into a vibrant and friendly setting. Since moving online away from their bingo halls, back in 2007, Bucky has managed to maintain their charm on the web, by creating a user-friendly environment for all those involved. The inclusion of chat rooms makes it easy for players to socialise on the app and signing up has been made into an easy process. Players just need to put in their personal details such as name, email address and basic bank details. It is not just us that are fans of the app. This mobile app from bucky bingo gets rave reviews in the iTunes app store and has a rating of 5 out of 5 which is fantastic! New players will also be eligible for Bucky’s welcome offer and bonuses, alongside free spins on the classic slot Rainbow Riches. This bonus is available to players over their first three deposits, in which they must deposit £10 each time. Specializing in bingo, players can play 75 ball bingo, 90 ball bingo, speed bingo and super free bingo. Not only this, you can even experience free bingo, which is available every day of the week on the app between 10am –11am and 10pm – 11pm. The game lobbies are also easy to access and join – players can just sit back and watch the fun unfold! Every aspect of the app is designed to enhance a player’s gaming experience. The online bingo features are some of Bucky’s most popular games on the app. With entry fees starting as low as 5p, the games look to accommodate for all levels of players. Alongside the bingo games, the Bucky Bingo app also holds some of the most exciting slot games around. From the all-time classics of Rainbow Riches and Cleopatra’s Chest to the special themes of Pirate Plunder and Kiss Me Clover, the Bucky app holds a whole bundle of choices to choose from. 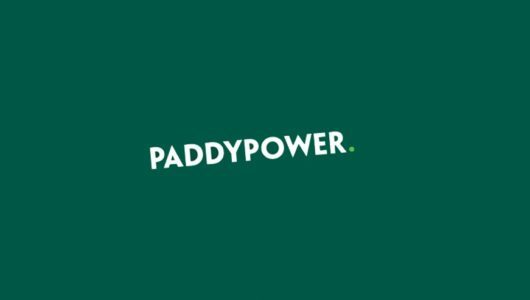 Check your balance with ease and use your money across any of the games across the app. There are so many to choose from with over 100 exciting titles and games available to players. Once you have your account it is real easy to buy tickets and then play them. Make sure you have funds in your account, then head to the lobby. Hear you can find all the games available or click on the schedule to see when the next games are taking place. Click on the room you want to join and in here you can purchase your tickets. Use the clickers to decide how many to buy and then purchase. Now all you need to do is wait for the game to happen. The bingo app from Bucky supports an auto dauber so you don;t need to tap the numbers when called, the app does it all for you! You will never miss a number or be slow to get one marked off this way! As you can tell, the Bucky Bingo app is a bundle of fun and excitement. With over 100 slot machines and online bingo games to engage with, the app will keep you entertained for hours on end. The chat rooms allows players to meet some kind people and socialise together as a bingo community.